Aboriginal and Torrers Strait Islander people are advised that this page contains images of people who have died. Women of all kinds had to cope with inconveniences during World War 1 but Indigenous women in particular suffrered from even greater restrictions. Dharug woman Marion Leane Smith was the only "identified" Aboriginal Australian woman to have served in World War 1 - but she had grown up in Canada and trained as a nurse in the United States. She did her war service as a nurse in France, Italy and the United Kingdom. 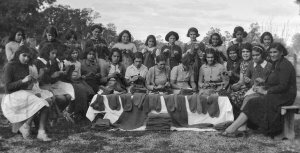 Scroll about two-thirds of the way down to the sub-heading "Women" for some general information on the role of Aboriginal and Islander women and a reference to the work of Oodgeroo Noonuccal (Kath Walker). ● A Civics and Citizenship (citizenship.edu.au) page Contains suggestions on how teachers can use this image in the classsroom. Poet Oodgeroo Noonuccal, also known as Kath Walker, joined the Australian Women's Army Service in World War 2. Presents details of some relevant books, links to interviews, and images.